If you know anything about this area and some parts of upper MI, then you’ve heard of fish boils, where White Fish and veggies are cooked in a large pot of boiling water over a wood fire. 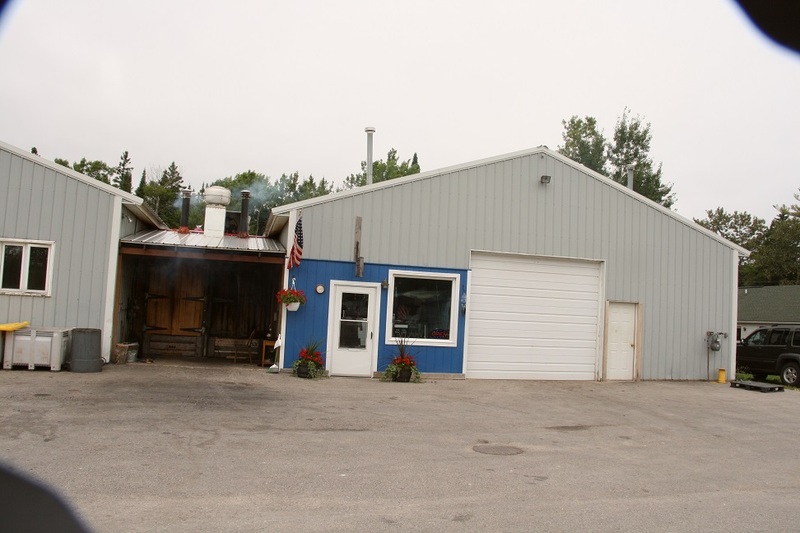 I’d seen a fish boil on one of the TV shows that features different restaurants and since one show had been about Pelletiers Restaurant and Fish Boil and we were camping five miles from their Fish Creek location we opted to give it a try. From the TV show, I thought they were out in the country, but they are actually located right down town but the set-up makes it seem like you are not. We awoke to overcast skies, an off and on drizzle, a good breeze, and cool temps – I wore a warm up jacket while doing my computing outside. 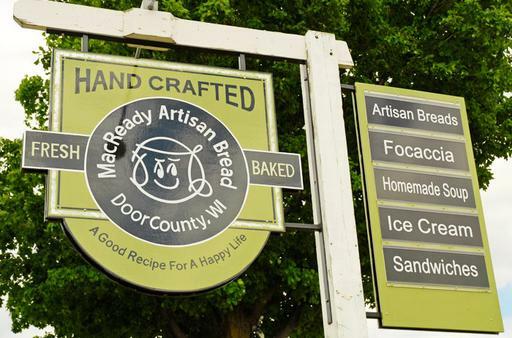 After a couple of failed restaurant stops (too crowded), we stopped at MacReady Artisan Bread Co. for some artisan bread and scones and took them back home for breakfast. The bread was pretty good but we all thought the scones were too dry so no need to return. We knew the maple syrup we had purchased in New Hampshire several years ago was about gone and when we saw it advertised here, we looked up a local supplier and went to their place to check it out. 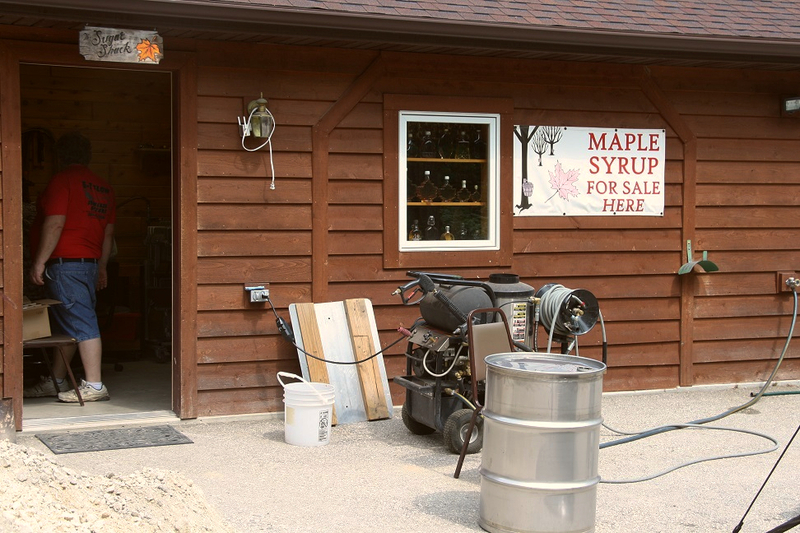 InTheWoods Sugar Bush Maple Syrup is literally in the woods among the 1400 maple trees that they tap from - not visible from the road and no sign. 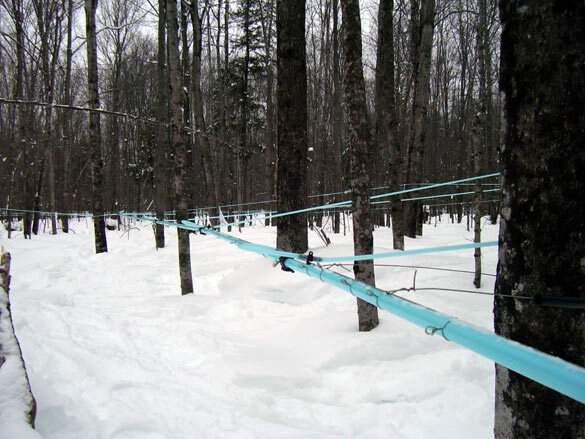 Their house and sugar operation share the same building and when you drive back their gravel lane in the woods, the first thing you notice is the blue plastic tubing running among the trees for collecting the sap. I failed to get a pic but someone else did. 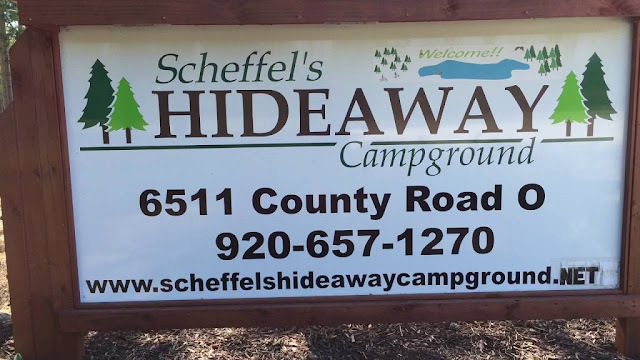 The campground is located a couple of miles north of Two Rivers, WI a town of 11,000+ that serves the local area with only a couple of tourists stops - being the birthplace of the ice cream sundae is their major claim to fame. 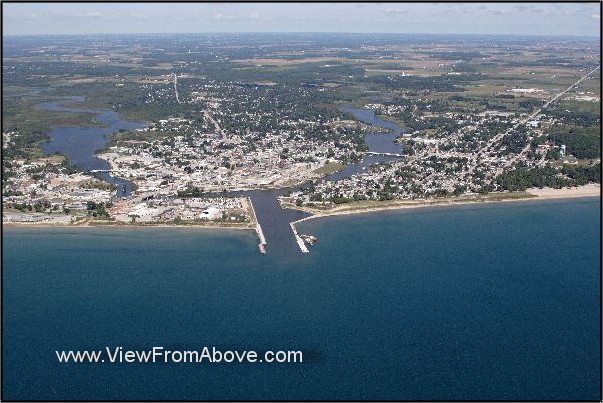 They have a very nice public beach area, several marinas and the name comes from the East and West Twin Rivers that run thru town and join just inland from Lake Michigan. This is the old fishing village. We departed the Brimley MI area about 9:30am on Wednesday and took the following route: MI-28, MI-117, US-2, US-41, MI-35, US-41, I-43, WI-143, CO-V, WI-42, CO-W, CO-O. None of the roads were really bad and they were generally pretty good for paved over concrete. One stretch of MI-28 was a little rough but they were actually resurfacing it. We gladly waited for three re-paving projects. MI-35 was a very scenic drive along the shore of Lake Michigan. On a sad note, while driving around MI and on the drive to WI, we have seen many closed or obviously depressed businesses. We rolled into Scheffels Hideaway Campground about 4pm (3pm with the time change) after a pleasant 6½ hour (305 mile) drive. I would rate this as a nice campground with three big draw backs for us – only 30 amp power, no sewer, (both of which I knew about) and afternoon sun. 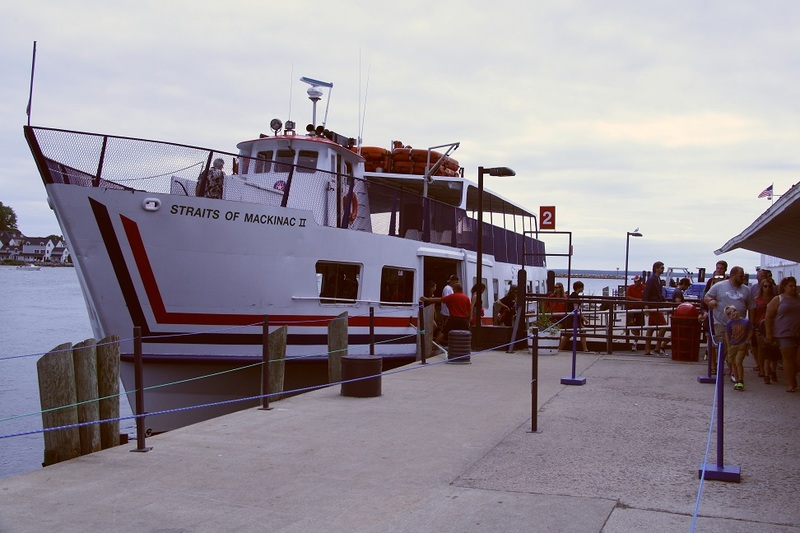 The power would not be an issue if were cool enough to open the coach but it wasn’t and we ran one AC and the other on high fan (remember, we have one down), which kept it just tolerable then we turned them off to use the microwave, hair dryer, etc. The primary reason for coming to Sault Ste. Marie was to see the Soo Locks which we finally did our last day in the area. For a good service to visitors, the locks has a 24 hour hotline that tells you when the next ships are scheduled to hit the locks and for this day, there was one due in at 11:45 am. 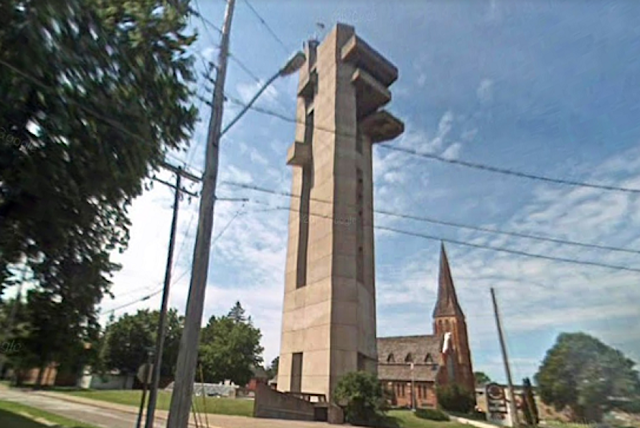 So we got ready and headed up to the Soo to make our first stop at the Tower of History which is a 210’ tall concrete tower with observation decks and a high speed elevator. After experiencing the crowds on Saturday, we decided to stay close to home on Sunday beginning with a breakfast trip just up the road to the Dancing Crane Coffee House but it turned out that all they had to eat was a few sweet rolls, ice cream, and pasties so we bought a half dozen frozen ones to go, and went back to the RV where Bev and I had a very good pasty and Pat had a meat loaf sandwich. It was unique though. After a relaxing afternoon, we headed down to Brimley for a late lunch at Jack’s Grub & Pub. Arriving at 3:30pm we pretty well had the place to ourselves. The cook is Polish and we went there for the specialties – Perogies for Pat and Cabbage Rolls for Bev and I but before the main course we had our first ever Poutine as an appetizer – French fries topped with cheese curds and brown gravy. It was very good but a little hard to eat as they used mozzarella cheese – we’ll be making his at home with curds from Sweetwater Valley Farms. These shots are of Pat’s and Bev’s meals. 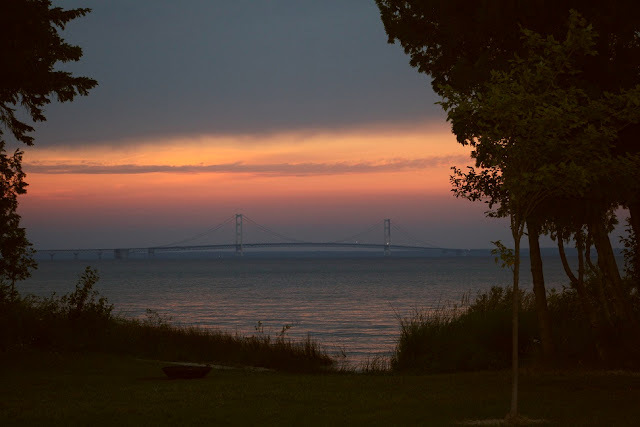 We pulled out of Mackinaw City about 10:30 and headed north on I-75 which was a pretty good road with only some of the paved-over concrete joints noticeable when we got close to our exit on MI-28 which was a good road. The short distance of MI-221was good and the Lakeshore Dr was pretty bad and typical of the lesser roads we’ve been on. 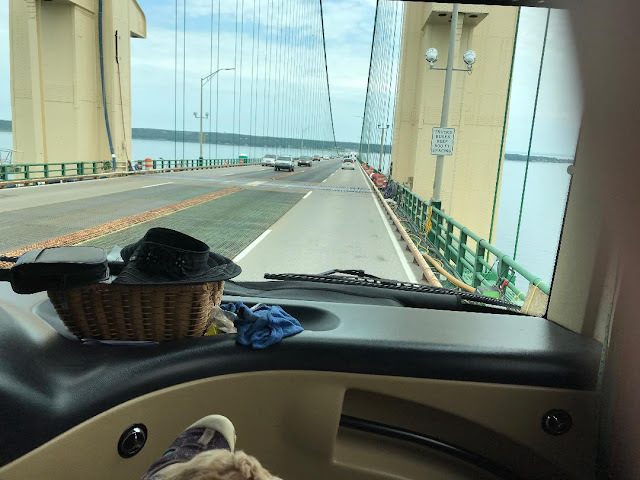 My mild anxiety about crossing the Macinac Bridge with possible winds was a total non event and Bev took a few thru-the-windshield shots with her IPad. 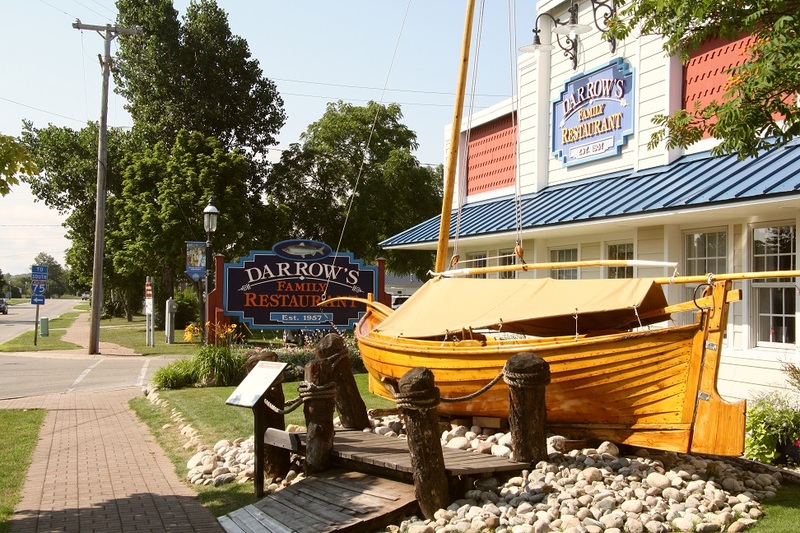 We started our last day with a trip to the highly rated Darrow’s Family Restaurant, a place Bev really wanted to try. Warning - Long post with lots of pics. Wednesday was devoted to the must anticipated trip over to Mackinac Island via a 45 minute ferry ride on The Star Line’s “Straits of Mackinaw.” We had purchased rides on the 15 minute fast ferry but it couldn’t hold everyone in line and we didn’t want to wait 30 minutes for the next one. The one we missed and the one we took. 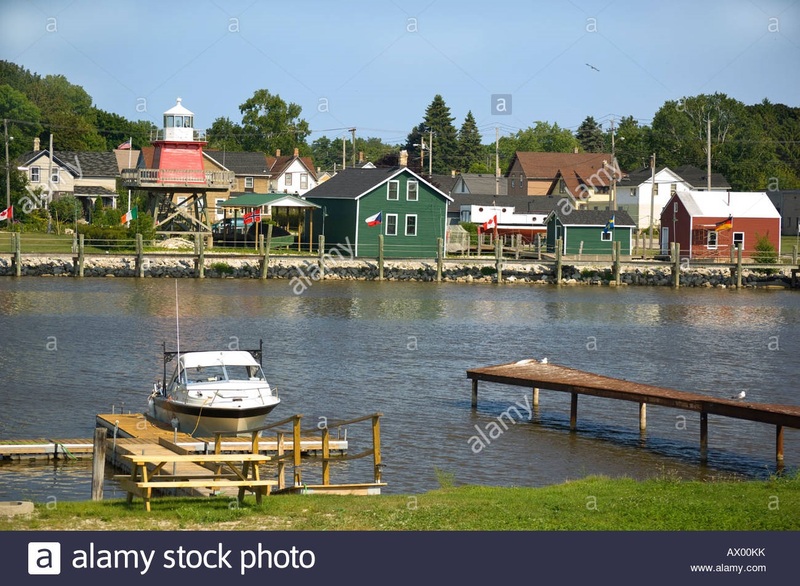 It’s cooler over here on the water than the Leelanau Peninsula and I awoke to 60F temps but at 95% humidity, I opted to stay inside for my morning coffee and computering. One of my goals while along the Great Lakes is to try the various types of lake fish and after two unimpressive restaurant meals, I decided to try cooking some myself. 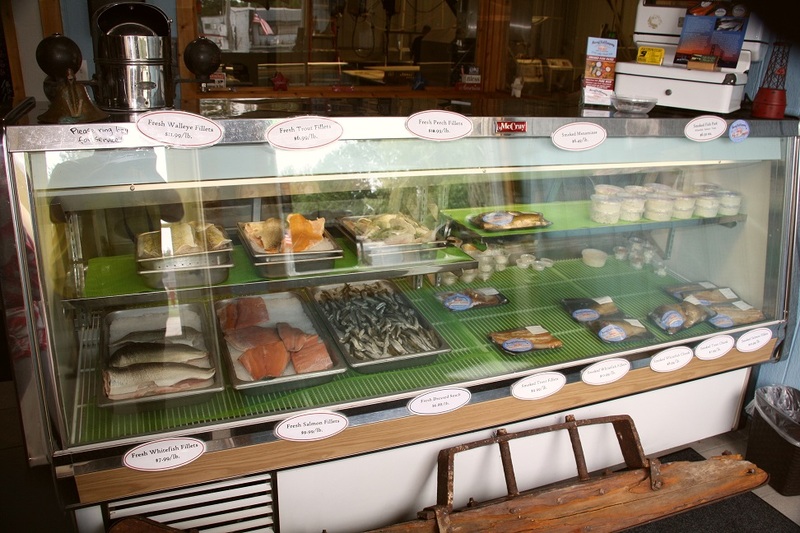 So after a little research and reading reviews (how did we live without the web), we decided to head across the Mackinac Bridge to Massey’s Fish Company in St. Ignace (ig-nis). The company is owned by a couple where he is the fisherman and she is the sales person – mostly to restaurants with a small retail outlet. Smoke from the fish smoker was billowing as we pulled up. Note: being the camera clutz that I am, I have my camera shooting very cool (blueish) pictures and I can’t edit all of it out so please overlook the varying photo colors. 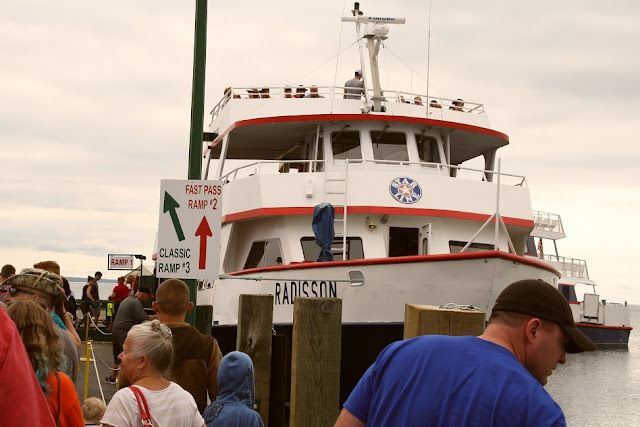 A/C Update – Saturday was our first hot day and, while it got into the high 70’s at the front of the coach, we made it fine on the 91 degree day and it helped that it got a little cloudy late afternoon. Using the portable fan to blow cool air into the bedroom worked well and while we usually have the bedroom cooler, I still slept under the covers. It’s good to know we can survive a day in the 90’s as I think we may see more on our way back south. Sunday was moving day and our 120 mile driving route was pretty simple – MI-22 back the Traverse City, US-31 to I-75 for one exit, then US-23 to the campground. 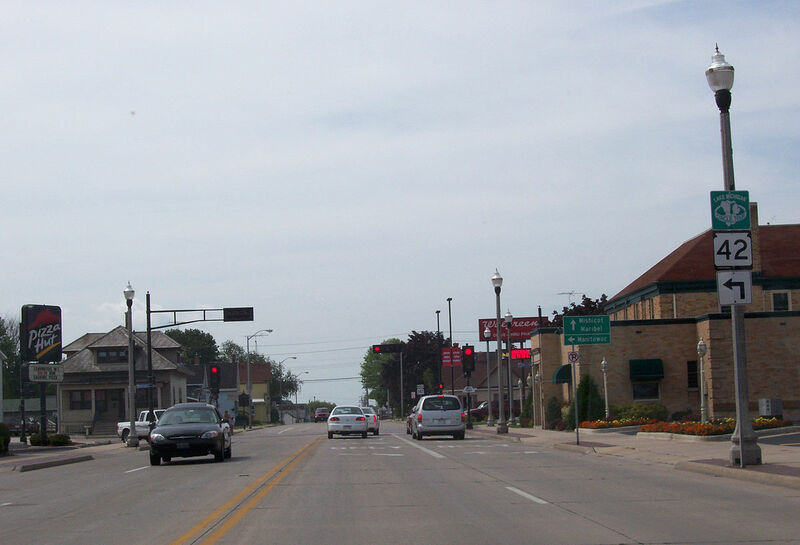 Except for a few repaired sections, US-31 was in bad shape and the coach rattle most of the way over here. 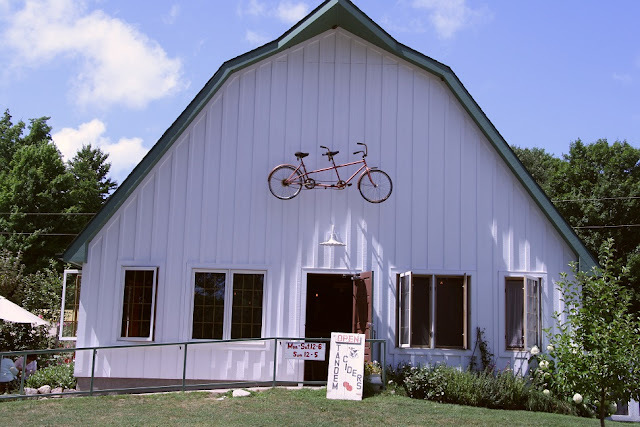 For our next to last day in the Suttons Bay, we decided it was time to hit the wine/cider trail and sample some of the local offerings before the weekenders poured into the area. This area is a major grower of cherries and apples, as well as some grapes. We began at Tandem Ciders about 10 minutes from the campground and drove past many apple orchards on the way there. They had a nice tasting room with two nice young ladies doing the pouring at $1.50 for a 3oz sample- we tried eight and the ones in this area are very different from those we’ve tried other places in that most are very dry. We began with the driest and worked our way to sweeter where I found the ones I preferred although they were not really sweet. I guess it’s like wine where you start out with a sweet white and work your way to dry red. 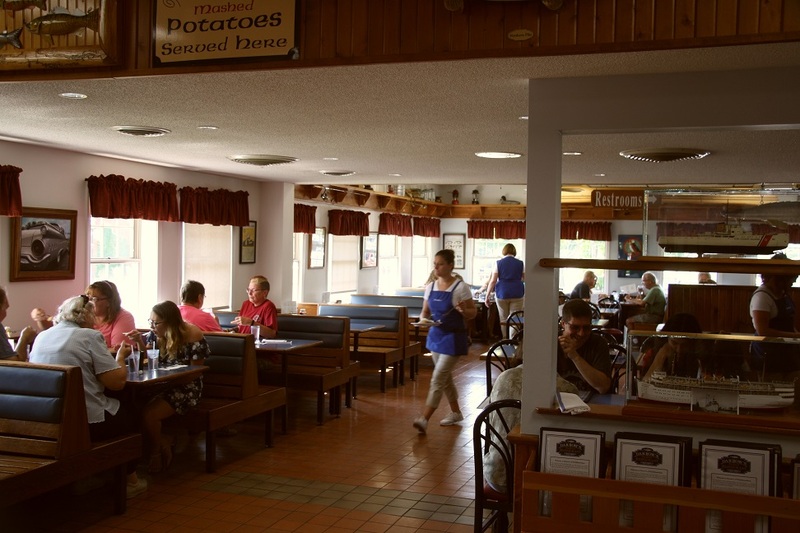 Today was primarily devoted to checking out the Sleeping Bear Dunes National Seashore but the first order of business was breakfast along the way at PegTown Station located in small, unincorporated Maple City, MI. It has a population of 207 and per Wikipedia – “Maple City had its beginnings in 1866 when William Parks and J. T. Sturtevant built a shoe peg factory on land containing several hundred acres of maple timber, and the community that grew up around it was at first known as "Peg Town." The restaurant was pretty full the entire time we were there and when I asked the server what brought people to Maple City she answered “We do, our food is fantastic” meaning the restaurant. Bev and Pat both ordered the breakfast sandwich and I ordered the corned beef hash plus we shared a very good cinnamon bun to start. 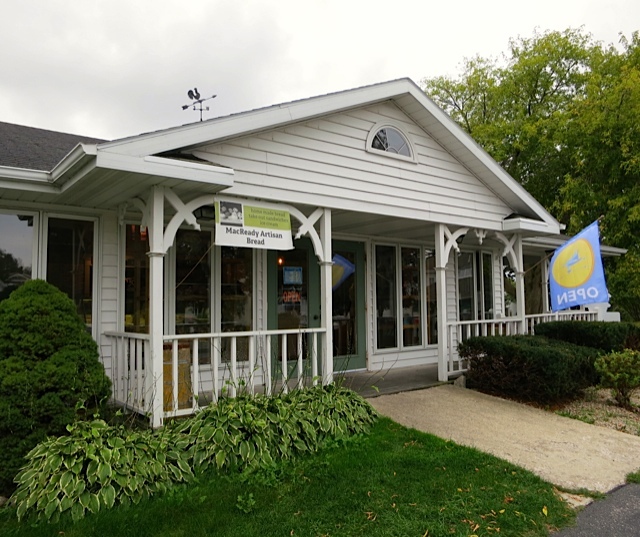 On Monday, we decided to drive around the upper part of Leelanau Peninsula but before we left, six year old Sophia from next door knocked on the door to ask if Teddy Bear could come out and play – I thought that was so cute. 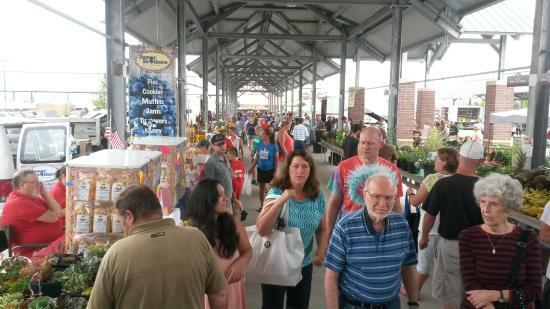 Today’s trip was to just get a feel for the area and see where we might want to re-visit, especially for the shoppers. We went up the west side of the peninsula and passed through the towns of Lake Leelaneau, Leland, and North Port before stopping at The Leelenau State Park. The park is located at the very top of the peninsula and is the site of a light house constructed in 1858. 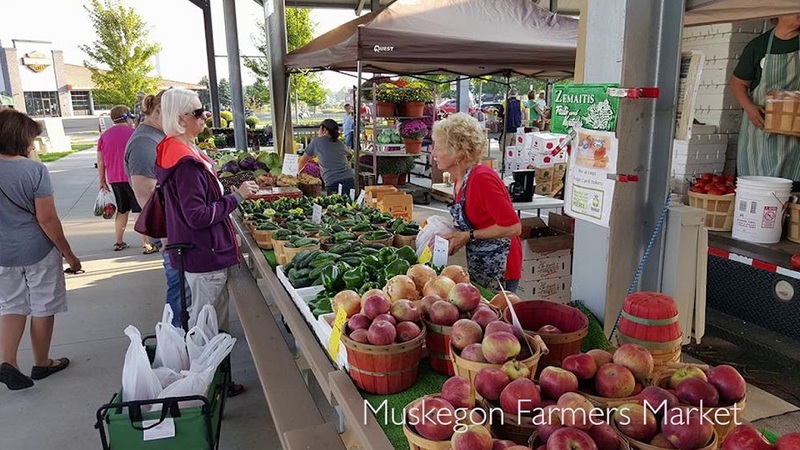 We awoke to a beautiful Saturday morning and after breakfast, we made the 15 minute drive into downtown Muskeegon, where I dropped the girls off at the farmers market, which looked to be really bustling. I didn’t take any shots but here are some from the web that Bev advises were accurate except she said it was so crowded it was hard to move around.